Continue on to see the RTTS teaser video, the RTTS developer blog, RTTS gameplay videos, and the MLB The Show 18 dev livestream complete with the world-famous TGT Recap. 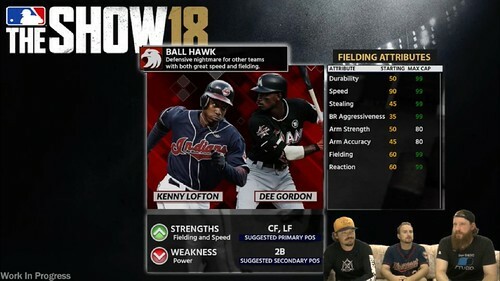 Hi everyone, this is Steve Merka with Sony San Diego Studios and MLB The Show 18 — let’s talk Road to The Show! This year we have made some pretty big changes in the way you experience the mode, and we think you are going to like them. The first change is the removal of micro transactions from progression. We wanted to remove the need to make purchases to progress your player and just focus on the gameplay and more pure experience. So this year, you will no longer be able to purchase Training Points. Instead, you will experience a new way to progress your created player, but I will get into that later. 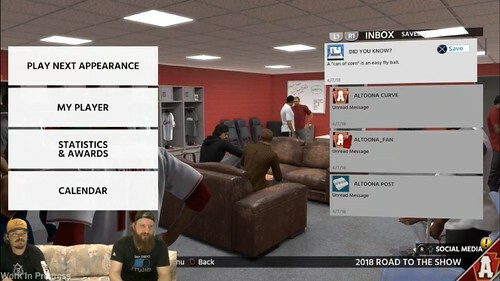 The removal of micro transactions from Road to The Show also means that you will no longer be able to heal injuries through stubs. You will just heal naturally. Another big change we made was how your player is created. 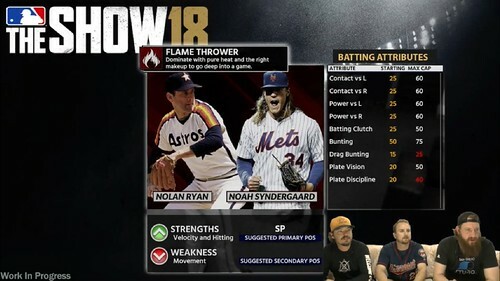 This year, your created player will have an Archetype. We designed Archetypes as a means to create more believable players and they reflect the various types of players currently found in baseball. 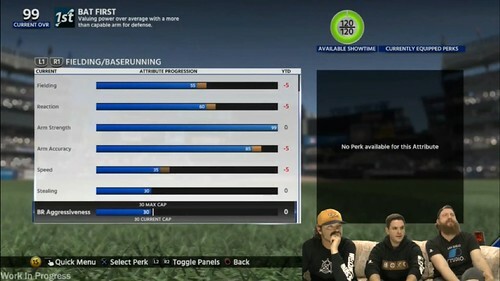 Each will have their own suggested primary positions, and there are specific ones for infield, outfield, and pitchers. Every Archetype has a pair strengths and a weakness. Some Archetypes may have big power potential at the sacrifice of speed, while others will be insanely fast, but lack the ability to go deep. For example; a Power Corner Archetype’s strengths are their Arm and Power, and their weakness is Speed. Lastly, Archetypes will have limitations to how powerful they can be in certain attributes. 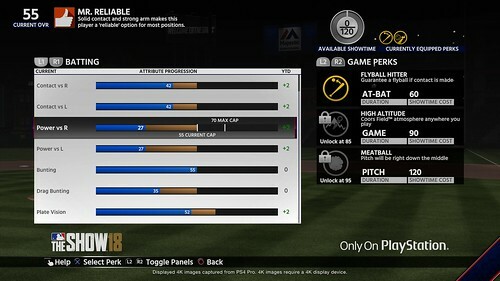 These are called Attribute Caps and you will need to be raised these during the course of your career if you want to get the most out of your player. 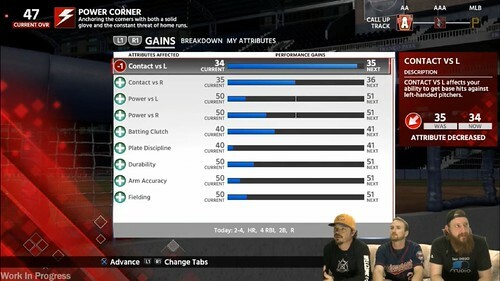 There are two types of Attribute Caps, Current and Max. 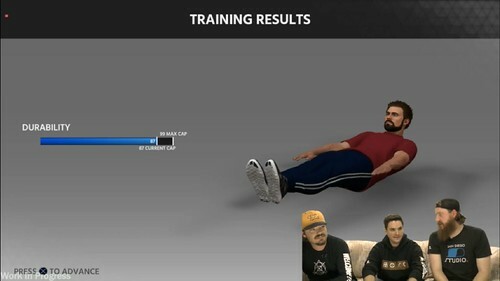 Current caps are temporary attribute limits that can be raised through selecting the appropriate Focus Training choice, during one of your training sessions. Training choices that feature a teammate are the only way to raise your cap. Be sure not to neglect these opportunities, because once you reach a Current cap, you will not be able to take advantage of any gains until the cap is raised. Eventually, you will reach an Attribute Cap, which cannot be raised. This is your Max Attribute Cap. 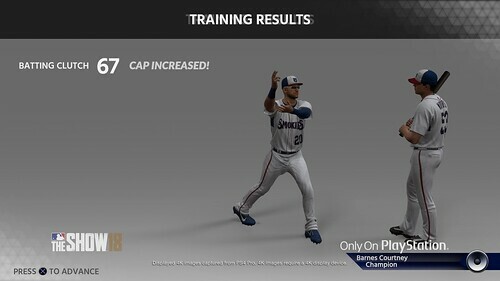 Max Caps are the best that your player can be at a particular attribute, through training. 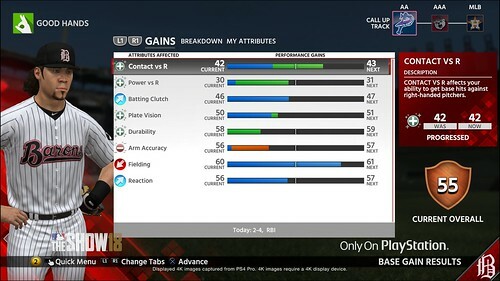 But don’t worry, you can use equipment cards to further enhance attributes, even past their Max Caps. Speaking of equipment cards, we have added even more equipment and rituals, to provide so much more variety for your created player. We know how much fun it is to find that right piece of equipment, which balances both looks and bonuses. 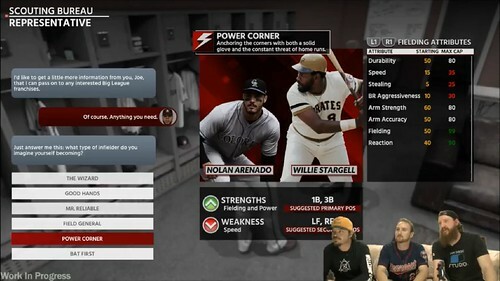 We have brought back our narrative experience to help tell the story of what it is like for a mid-to-late round draft pick in the baseball world, with a newer minimal UI. In addition to keeping the strong storytelling presence, this year, we are taking some major steps in one of our favorite modes. In addition to Archetypes, we changed the way you progress your characters, as you pave your path. 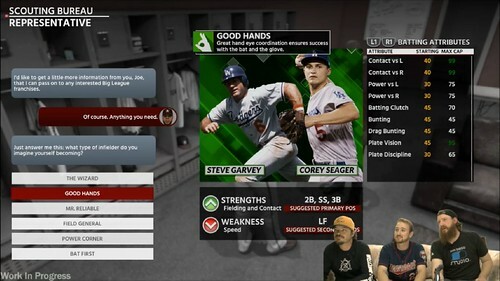 We thought about how our previous progression system worked and we asked ourselves, “Does this feel good?”, “Is this how you would progress in the real world of baseball?” and “How do we create a more seamless experience?” After discussions, between ourselves and with professional players, we came to an answer for how player progression should work. Progression is now a two part experience. The first way that you progress and get better is on the field. As we all know, you learn by doing, and your abilities will award you gains to your player’s attributes. We felt like this was a very organic and passive way to progress. You just play the game. Every on the field action you make will feed into your player’s attributes. For example, if you hit a monster bomb off of Chris Sale, with runners in scoring position, then your player would earn gains in their Power vs Left and Batting Clutch attributes. 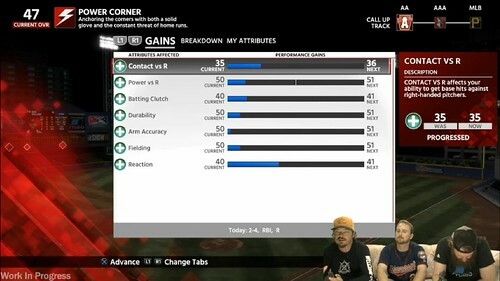 You will be able to track these gains, both during the game, as they happen, and at the end of the game, on the Base Gains screen. The hope is that both you and your player improve together, as you play. The second way that you will be able to improve your player is through Focus Training Choices. Previously, you had the power to take all accumulated training points and place them wherever you wanted. This year, we removed the hassle of getting into a groove, of playing some of your best games, and then having to spend that growing sum of points to play catch up on lapsed training. Now, you will be presented with a quick choice experience, during the course of your season, where you are presented with a short list of options. These options represent areas you want to specifically focus and train your player, in order to improve. You will choose one from up to four facility themes. Each facility will have their own specific training exercises. You will choose the training exercise that suits your needs and then improve the specified attributes. It is just that simple. 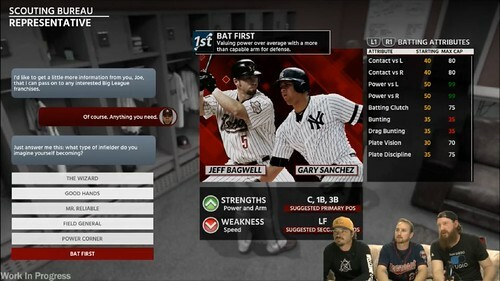 This will allow you to choose how your player progresses, while allowing you to get back to playing the game. When we interviewed players over the past two years to help build Road to the Show, every player we spoke to, mentioned that a big part of their growth came from learning from other players. We wanted to try and reflect that this year in some way. So, as mentioned previously, All Player Archetypes have temporary caps. You will have the opportunity, during a Focus Training session, to choose a teammate to learn from and have them help you push your player’s potential. Managing your Caps is important, because if you neglect them too long, and an attributes caps out, then you will not be able to gain progress in that attribute and will have to wait for another opportunity to train with a teammate. 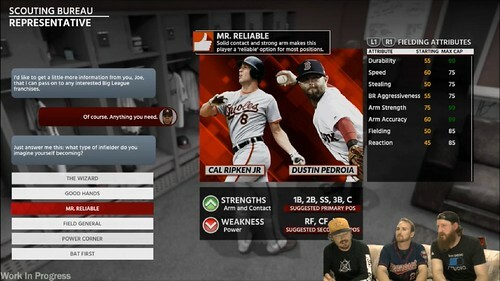 Finally, I want to write about the customization improvements available in Road to The Show. As a team, we have made it one of our biggest priorities to improve the look and appearance of your created player, while offering you more ways to express yourself. We know that this is the starting point, of your Road to The Show experience, and it should offer everything you need to make you or your ideal version of a ball player. This year, we have taken some steps to help make this process a best in class experience. Our Art Team has been busy all year to improve the quality of our skin tones and how they look in various lighting conditions. This year, in MLB The Show 18, your player’s skin tone will have an even more natural appearance, and look more realistic. In addition to skin, all of our hair has been re-worked, in order to look and react more like hair. This is for both facial and head. Now fade hairstyles transition better from shaved areas to the grown out parts, while mustache, goatee, and beard fidelity reflects a more realistic look. 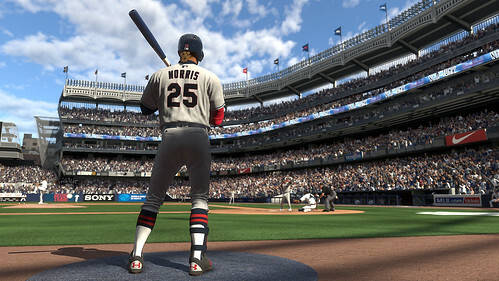 A major addition to the player customization experience is the brand new Batting Stance Creator. Batting Stance Creator will allow you the opportunity to tweak and adjust that perfect batting stance to reflect your personal style. We even exposed the values, so you can share these with other people. 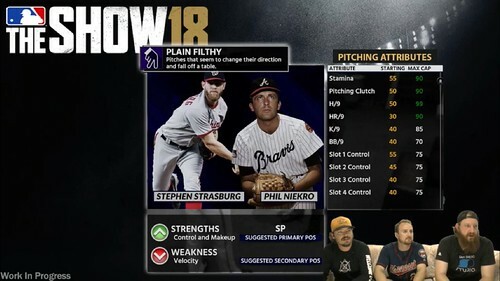 All of these adjustments to provide a deeper level of customization and uniqueness to created players. So fine tune as much as you need! 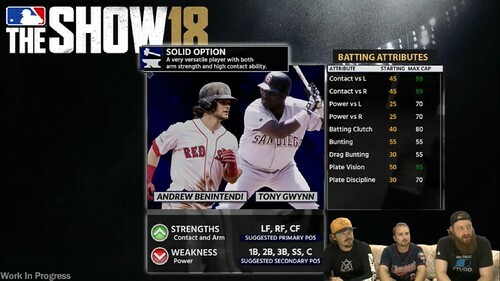 These new changes to Road to The Show are just the next steps in our journey to provide the best single player sports gaming experience possible. We look forward to seeing which archetypes you select, what meaningful career choices you make, the stances you create, and of course, how successful they become in The Show! 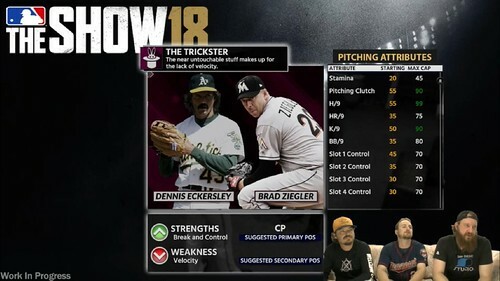 This is just an overview of what Road to The Show is about, so be sure to tune into our livestream on Twitch, where we will go into even more detail about this awesome mode. 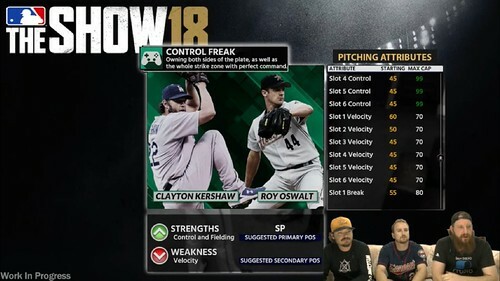 You can also stay up to date on all things MLB The Show 18 by following us on Facebook, Twitter and Instagram. 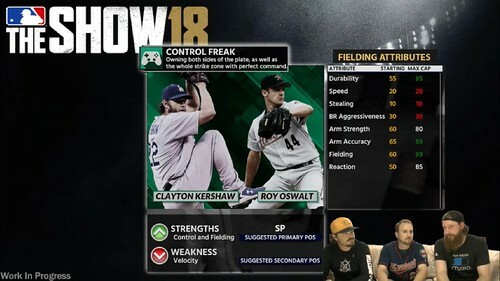 Or learn more about Road to the Show on our Twitch stream at 2PM PT today. - Gil Garcia joins the stream. 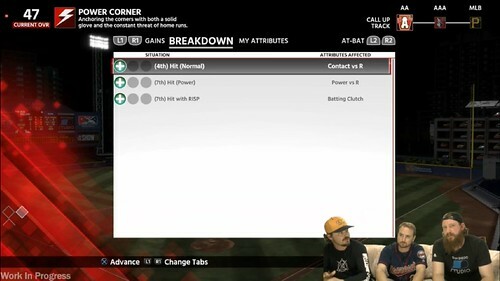 Gil is the Lead Character Artist for MLB The Show. 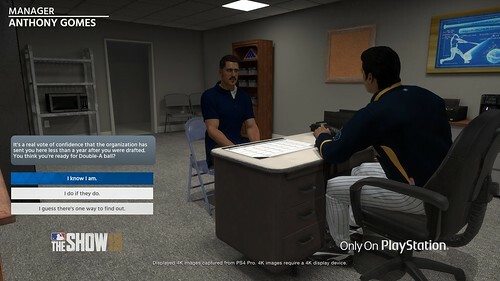 They try to make all 1,500 players in-game look as accurate as possible and also makes the in-game assets players use for Create-a-Player. - Character Creation shown. 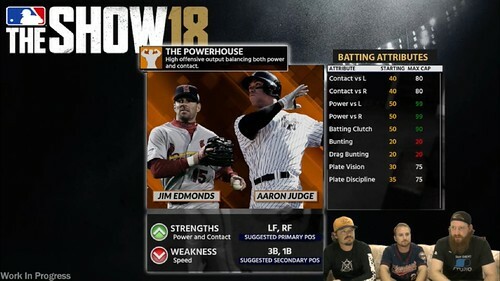 Improvements mentioned include new hairstyles (some replaced) and improved textures, new face types, batting stance creator. - The Wheel of Misfortune is shown. Jody Kelsey joins the couch for his spin of the wheel and then departs. 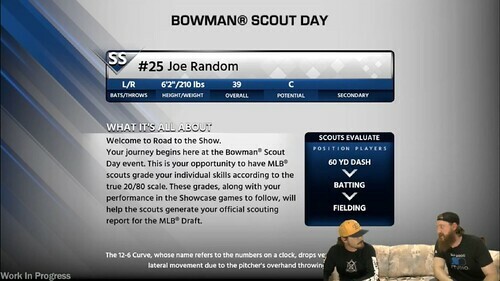 - Bowman Scout Day returns but story is new this year. 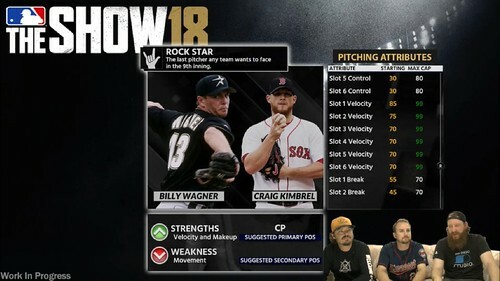 While retaining documentary-style feel from MLB The Show 17, you are not beginning as a top prospect. Your player must work to gather the attention of scouts to become a late-round draft pick. - Kyle Blake (aka Kyle 2.0) joins the stream to talk about player archetypes. - Each archetype will have strengths and weaknesses (starting point and cap for each attribute). For example, a great defensive outfielder may come in with high speed, while his power may be lacking. A strong, power hitting outfielder may have low speed (and a low cap on the attribute) while starting with high arm strength and power. 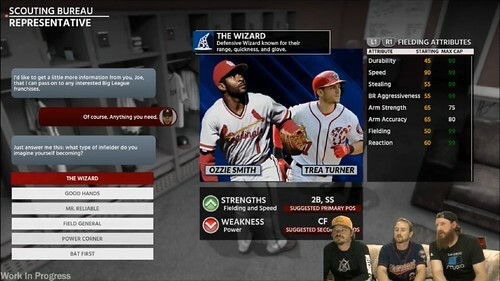 - Equipping equipment can get attribute above the cap. - Archetypes are independent of position, though positions will be suggested for each. - If the player’s position changes, they will have ability to change or retain player archetype. 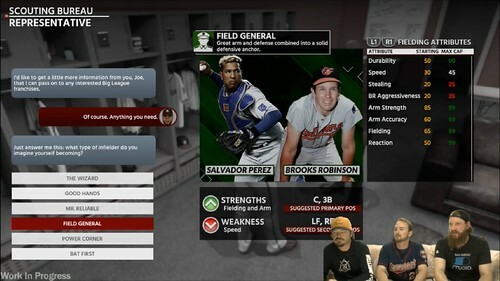 - Outfielder, infielder, & pitcher archetypes shown during this segment. - No more training points. Every action affects attributes. Results will be accumulated and shown in the post-game under Gains, Breakdown, and My Attributes screens. Based on performance these can go up or down and also to three varying extents. - Can get base gains by simming, but will be much lower than playing games. - Kyle 2.0 leaves the show. - Merka shows off the revamped UI and menu system. - Chris Gill joins the couch. - Gameplay improvements shown via video clips. - Via controller speaker, teammates will yell where to throw the ball on plays such as deep flies. - Chris Gill leaves the brand new, soft couch. 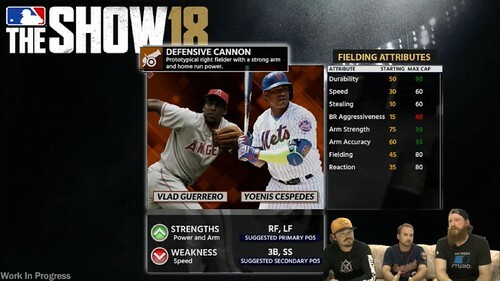 - Chris Muriel joins to talk about outfield gameplay changes. They begin with a video showing changes. - Camera pulled out behind outfielders to show more of field. Camera cuts reduced to help with fielding as well. Cone and ball will get smaller as OF approaches ball and/or proper fielding location. - These occur on days off and are basically extra training sessions. User will see player briefly do drill and then final Attribute result. User will not actually play these drills. - Users can advance attribute ratings to their current cap. - Post-season scene showing player in discussion with agent concerning player’s age. User can then decide what part of their game they want to focus on to “preserve”: Skills, Strength, or Athleticism. - Regression begins at age 34 and attribute decrease values increase as player ages. For example, at age 40 attribute decreases may be in the double digits. - Some attribute increasing equipment shown, namely Rituals. - Question from chat: You can indicate to agent if you desire to go to another team. 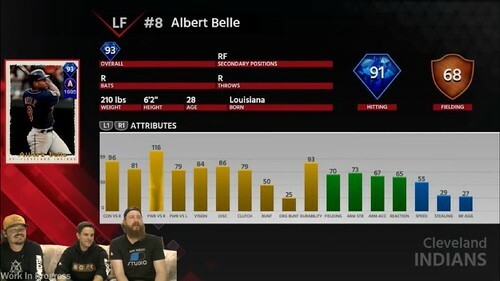 - Ratings revealed for Albert Belle including 116 Power vs R and 96 Contact vs R.
Next week will focus on Franchise Mode. 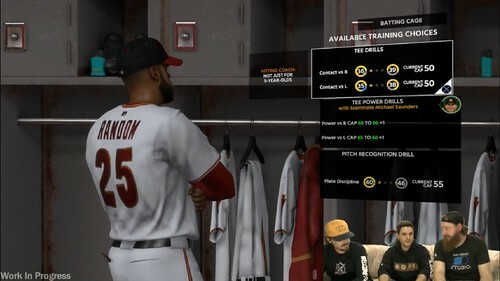 This week's GameStop Mondays video provides the basics of RTTS improvements in a few minute clip. Wasn't gonna, but decided to make the jump! 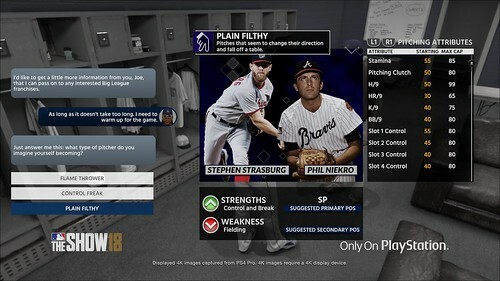 Yeah, I was originally gonna wait and maybe pick it up for cheap down the road, especially since the OSFM minor league rosters won't be done until at least early May, so I won't be able to start a franchise until then anyways, but with the overhaul to RTTS plus the changes they made to franchise, what the hell, I'm in!